A large pastel painting of a Monterey Pine tree on paper. This painting was made especially for The Spirit of Wildwood exhibition at Tanner and Lawson's gallery in Chelsea. It is available to buy from the artist. 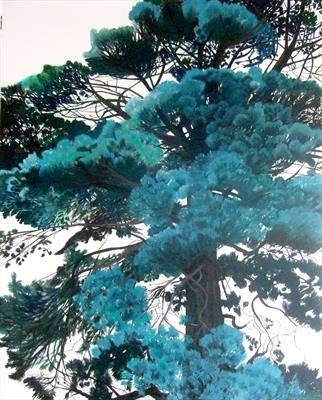 This is a large painting made to celebrate a tree growing in Saltash, Cornwall. It shows the massive extent of the canopy, and some of the trunk and beautiful foliage. It is one of a series the artist has made exploring this particular tree.